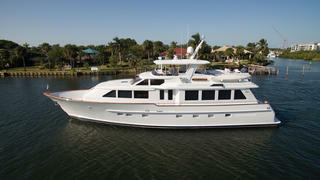 The 25.91 metre motor yacht Checkmate, listed for sale at 26 North Yachts, has had a further $254,000 price reduction. Built in aluminium by US yard Burger Boat to a design by Don O’Keefe, she was delivered in 1999 and had a full refit in 2013. Accommodation is for up to six guests in three cabins consisting of a master suite and two double cabins, all with entertainment centres, LED television screens and en-suite shower facilities. In addition, there are quarters for two crew aboard this yacht for sale. The full-beam main saloon boasts a working fireplace close to the dining area, offering the opportunity for fireside dinners for eight guests, while the well appointed lounge area has comfortable seating, a bar and an entertainment centre including a 47-inch LED television screen with a stereo surround sound system. Further forward, top-of-the line appliances in the galley create an enjoyable experience for guests and crew alike and there is an L-shaped banquette with a granite-topped table for informal meals. The impressive custom flybridge was modified during the 2013 refit and has a helm station forward and a television screen that folds down from the hard top. To port and starboard are built-in bench seats with two large teak tables seating up to 10 guests and an eisenglass enclosure can provide complete protection in poor weather. Twin 1,400hp Caterpillar diesel engines power her to a cruising speed of 18 knots and a maximum speed of 23 knots. Checkmate is now asking $1,995,000.